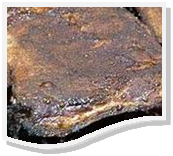 This is a great dry rub that can be used on pork roast, chops, and ribs. I use this on any pork I’m going to smoke or grill. A bottle of this will last through the whole grilling season. For most meats, sprinkle just enough on to color it. Not too thick, about 2 tablespoons per side of a large slab of St. Louis Cut ribs. Before using the rub, lightly cover the meat with either mustard vegetable oil, either work great! Massage the rub into the meat at least an hour before cooking. Enter your email address to subscribe to Guy Food Guru and receive notifications of new posts by email.